We know, we know, the “professionals” say that you’re NEVER supposed to go to a restaurant during the first few weeks of opening, let alone the first day! And we totally understand why, but what you gotta understand is, after Dan RAAAAAAAVED about his preview of Hoodoo Brown Barbeque a few weeks ago (when Kristien was at a 6.5 hour hair appoint–yeah, WTF? ), saying it was some of the best BBQ he’s ever had, Kristien HAD to get in ASAP to confirm his declarations. Apparently we weren’t the only ones excited because even way before their opening at 5:30 on May 23, there was a line that stretched down the parking lot with people ready to get down and dirty with Nestor Laracuente’s Texas outlaw BBQ. Pretty awesome for a first night in business, huh? When we arrived, we were told that there would be an hour wait, so rather than just stand around, we found a nice and cozy spot at the bar where Manager Chris Sexton was working with a few others including an Admiral of sorts. Beer tops were popping, drafts were being poured, and drinks were being shaken (and stirred). And, despite all this chaos, they held their own pretty well for the first day. Since we were at the bar, we figured, hey, let’s start with some drinks. So, we looked at the special, abbreviated Soft Opening menu and saw that there were three mixed drinks up, 8 brews on draft, 20 bottles, a plethora of whiskey, and plenty of wine choices. Like good food & drink bloggers should, we went right to the hard stuff and ordered a Rodeo Ride and Front Porch Peach Tea to start. The Rodeo Ride came out looking like lemonade, and there were definitely different flavor profiles going on with the mixture of Absolut Texas, honey, fresh jalapeños, and lime. There was a nice, soft floral scent coming off the drink, but when you take a sip it’s anything but soft, packing a strong vodka punch. There was also a nice kick coming from the peppers, and the lime added a nice bright flavor to contrast the Absolut. The drink got better (Dan ordered 2 more) as the night went on and as our Admiral got more comfortable making them, though it was funny to watch him and Chris try to remove the glass from the shaker as the honey made it super sticky. Kristien’s Front Porch Pea Tea was her jam and she stuck with it all night with 2 more drinks (she could’ve had 5 more but she was driving, darnit). This glass of deliciousness features Peach Sweet Tea made by Nestor, Bird Dog Peach Whiskey, and Ol’ Smoky Peach Moonshine. It was well balanced, not overpowering yet the whiskey flavor came through, and of course, it was SUPER refreshing. Now, if you know us, you know we couldn’t wait an hour for food (what are we animals? ), so we decided to order the Texas Poutine featuring crispy fries, brown gravy, cheese curds, and brisket debris. We can’t say enough about this dish: it’s a must order. The gravy was thick and rich which was a nice complement to the creamy curds. The fries really had that nice crunch and the brisket debris (just shredded brisket) added that nice fatty and meaty taste. And, speaking of brisket, Chris was generous enough to bring us a nice plate to try. Ok, now we’re going to describe the brisket, but warning: it won’t do it justice at all! The brisket was moist with this real nice layer of fat around it and an INCREDIBLE black peppercorn bark. Each little tug broke the beef apart so we could savor it piece by piece. Every bite was PERFECT, the bark so flavorful, the fat melting in your mouth, and the tender meat so moist . Kristien is a brisket snob (it’s her fave) and she has confidently declared it the best brisket she’s ever had. That’s no joke. As we downed both of those and threw back our drinks, Nestor came out to chat. He was so incredibly impressed with the response and mentioned how they went through a crazy amount of poutine . . . so much so that they we actually got the last oder of the night. Yeah, that’s over 40 cases of hand cut potatoes made in their kitchen. He then teased us with talk of his smoked ice and promised he’d bring us some for a unique drink. That drink? A Smoked Maple Old Fashioned made by Chris. Now, while you won’t find this on the menu yet, be patient because this drink takes the typical old Old Fashioned up a whole lotta notches. A bit of the smoke comes through and there’s a nice undertone of sweetness coming from the maple syrup. Very well balanced. At the time, we met one of the owner’s (Cody Sperry’s) dad and he brought us over a plate of smoked wings to try. While we did think that the skin could have been crispier, the smoked flavor packed inside those wings was amazing. The meat, itself was moist, juicy, the skin had a nice smokiness, and the sauce brought a nice level of spice to it. Just as we were finishing these up, we got our table off to the side of the bar. Even with the smaller Soft Opening menu, we still had trouble deciding what to order, but it was a bit easier because the hungry crowds had devoured all of the pulled pork and St. Louis Ribs. So, our strategy was to try the Beef Ribs and nearly all the sides on the menu. As we waited, Nestor came by to check in on things and ask if we ordered the pork belly. We didn’t, so Nestor promised to give us just a few pieces to try. When everything arrived, it was clear that Nestor had not given us a few pieces of pork belly: there were eight pieces there. Having had the pork belly before, Dan was even more impressed this time around. The skin was crispy like chicarrones, while the meat and fat underneath just melted in your mouth so delicately. Perhaps one of the best servings of pork belly that we’ve ever had. And the ribs were there, too, so delicate, so beautiful, and so rich with that same amazing black peppercorn bark. This is, again, a must order dish and it’s hard to find a better set of ribs anywhere in CT or the Northeast. And, of course, let’s not forget about the sides. We feel like BBQ joints around these here parts fall short on either the meat or the sides, and rarely does one place kill it with both. I mean sides need equal care, love and attention too, right? Well, apparently Hoodoo agrees because the sides were . . . well, let’s take it one at a time. You can order them as “Just for Me” at $5 or “Feel Like Sharing” for $9, but since we were trying too many and already ate a ton, we went with the smaller portions. Ok, the Mac & cheese was creamy and had a nice hint of heat to it—very nice. The Apple Vinegar Slaw was bright, fresh, and fun and a good way to break up the heavy richness of the meats. We loved this one most. The Loaded Potato Salad which was delicious, had lots going on inside like chives and remained lighter and fresher than the typical potato salad. There was also the Candied Yams which were delicate with warm Autumnal spices brightening this side and chunks of walnuts to add some contrast. Then, the pit beans which were smoky, spicy, with a nice sweetness to them. And, we finished things up with the Cajun Corn on the Cob which was our least favorite, but still decent. We shared with Cody that we thought the flavor was good, but there was too much Cajun powder and not enough butter. All in all, we were impressed with the sides and think that Cody and Nestor did a great job of putting them together and preparing them. 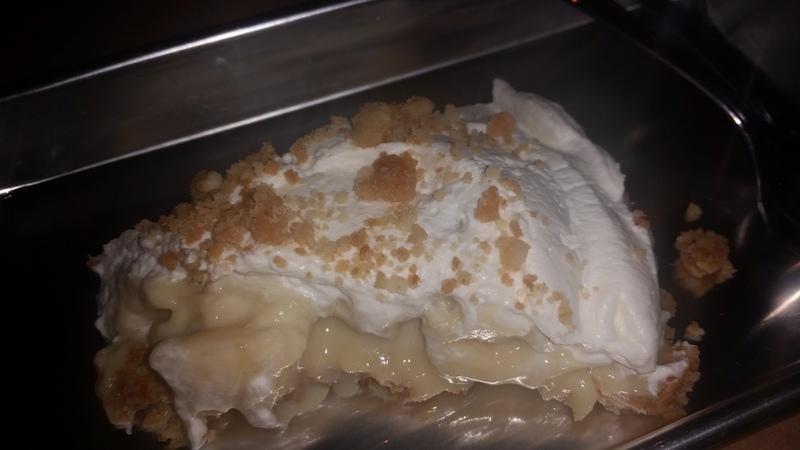 As if that weren’t enough, just for fun, we tried the Banana Bourbon Creme Pie because pie, because bourbon. The pie itself was creamy and silky with nice crumbles on top that added a nice crunch. The thing that we liked about it is that it was made with real banana, not fake banana pudding crap. Yep, just a nice undertone of banana with a good kick from the bourbon, too. And, even cooler: Cody’s mom made it! While there were some issues in service it seemed (not directly to us but others), that is more than expected on a busy opening day or even month. We were happy to see that things went as smoothly as it did. Drinks were good to start, the BBQ’d meats are beyond fantastic and, without a doubt, some of the best that we’ve had, and the sides were great, bringing together everything to make up an excellent and satisfying meal. 1) The bar. It has rich wood, is rustic, and definitely makes you feel like you’re back in a Texas saloon. The drinks are poured out nicely here and go very nicely with the meats and sides. We feel like this will soon become the bar where everyone goes to in the Ridgefield/Wilton area. 2) The meats. Nestor puts so much care into all of his meats. Just to get ready for opening day, Nestor worked nonstop since Thursday and he even brought his family up to stay at a hotel nearby just so he could get a few more hours of pit time in. We’re excited to come back and try the St. Louis Ribs, pulled pork, burnt ends, and even try out his smoked lamb. 3) The sides. We like that they aren’t an afterthought here. Nope, they stand their ground against Nestor’s deep and rich flavors and, in some cases, help to contrast it with bright and fresh flavors. 4) The vibe. It’s fun, it’s celebratory, and it’s a real chill spot. The decor is fun with folded steel wall coverings and cool lighted signs. They’re popular, though, so get ready to wait . . . but be smart about it and get some drinks at the bar. While we received some items to try for free, we paid for the majority of our meal. Despite getting free dishes, we were not required to write a positive review. The opinions expressed are 100% truthful based on our tastebuds, preferences, and opinions, because that’s how OmNomCT rolls.